Click here for a larger version of the above image. An infrared-cut (IR-cut) filter blocks infrared light so that the sensor only receives visible light. This ideal for daytime use. The NoIR lens with no such filter is ideal for nighttime use. You would then need to provide an infrared light source (typically, an array of infrared LEDs), which can illuminate your scene using a wavelength of light that is invisible to the human eye. In this way, JeVois can still "see", thanks to the reflected IR light, even in what appears to humans to be complete darkness. 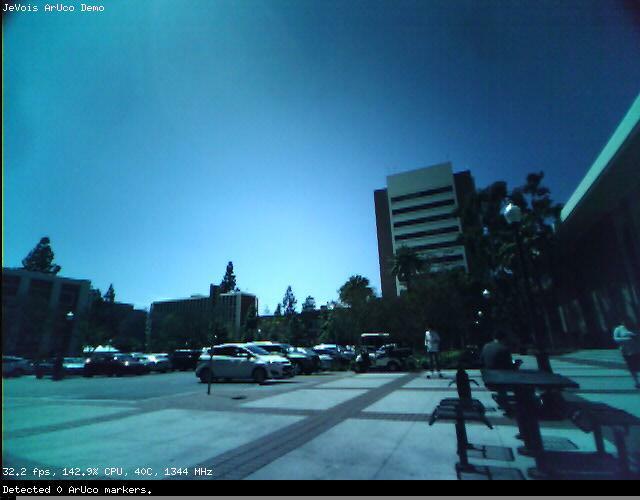 Many security cameras use this feature to provide nighttime monitoring. 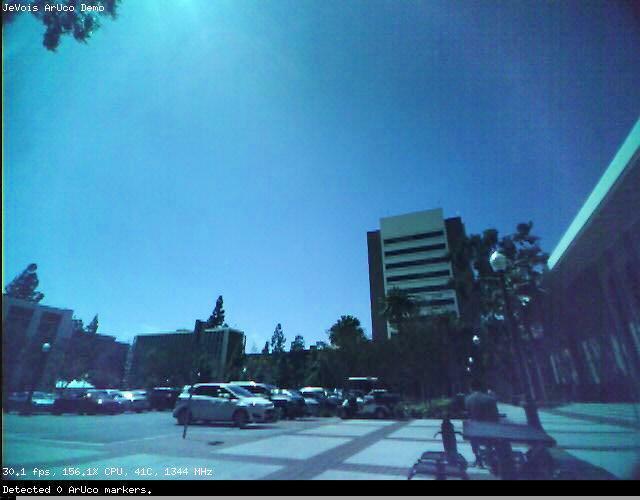 A no-distortion lens features a broader field of view, but with very little spatial distortion of the image, so that straight lines in the world are seen as straight lines in the video captured by the camera. In contrast, very wide-angle fisheye lenses suffer from so-called barrel distortion, named because an array of vertical lines will be imaged by the camera as curved, as if on the surface of the barrel. This is the flip-side of getting a much wider field of view with fisheye compared to conventional lenses. JeVois provides an algorithm for the correction of barrel distortion, which runs on the GPU inside JeVois, see JeVois module DemoGPU for example. Note that for all except the standard lens, the lens has been adjusted at the factory for a focusing distance of 30cm to infinity. In addition, we asked the factory to NOT glue the lens once focused. So, you will be able to easily change focus by simply turning the lens. Once you have found your optimal setting, you should fix the lens using a small drop of glue, paint, nail polish, etc on the thread (as was done with the standard lens pre-installed in JeVois). Standard lens: most versatile, no distortion, fixed focus of 40cm to infinity. Provides a relatively narrower field of view but this means that objects appear bigger and have more pixels on target, possibly making them easier to understand by JeVois (e.g., decoding of QR-codes or ArUco markers). NoIR lens: no distortion, same field of view as the standard lens, adjustable focus, no IR-cut filter. Mostly useful for night-vision applications, using an infrared illuminator as a light source. 90deg lens: wider field of view than the standard lens, no distortion, adjustable focus. Because there is no distortion, using this lens does not require any barrel correction, as is needed when using lenses with an even wider field of view. Use this lens if you need a wider field of view than the original lens, with no need to correct the image for distortions. Note how objects in front of JeVois will appear smaller with this lens compared to the original lens. But in exchange, you will see more broadly to the sides of the optical axis. 120deg lens: widest field of view, barrel distortion, adjustable focus. Use this if you want a much wider field of view than the original lens, with the awareness that you will likely need to spend some CPU or GPU resources de-warping the barrel distortions. Note how objects in front of JeVois will appear smaller with this lens compared to the original lens. But in exchange, you will see much more broadly to the sides of the optical axis. This requires some skills but can be done in less than 5 minutes. See the video below for full details. In some situations, it may also be useful to use corrective lenses placed in front of the standard lens. For example, one may want to achieve microscopic accuracy, or one may want to read small text, or one may just need to focus onto objects very close to the camera. Above is an example using a 15x lens taken from a pair of jeweler glasses that had interchangeable lenses. Using this corrective lens (which was not very well aligned in this example, hence the distortions), we can focus well on the tiny text of that 2.5" hard drive, at a very short distance from JeVois. Different lenses have different amounts of shading with eccentricity. 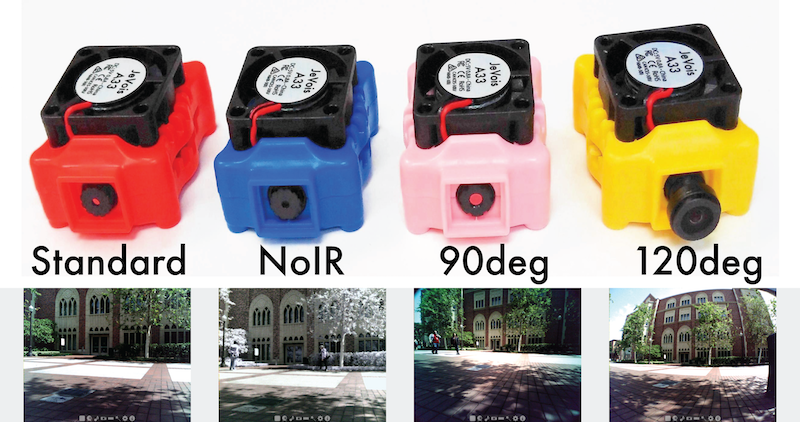 The JeVois camera sensor chip provides some low-level register settings to help improve image uniformity with different lenses. If you are using some of the custom lenses in your JeVois camera, read on. 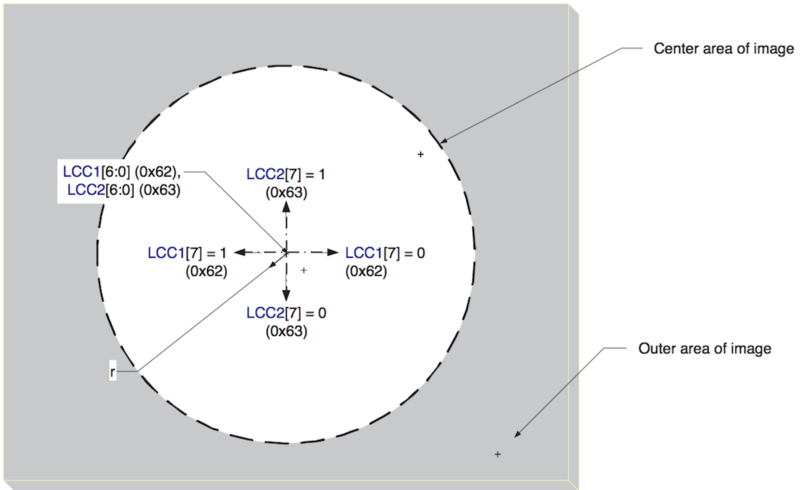 Camera registers LCC1 (0x62) and LCC3 (0x63) allow one to adjust the location of the correction disk, by specifying an offset (in the direction specified by bit 7 of each register, and with a magnitude specified by the remaining 6 bits) from the sensor's center point. Notably, register LCC3 (0x64) sets the gain (strength of correction) and LCC4 (0x65) sets the radius of the central no-correction disk. 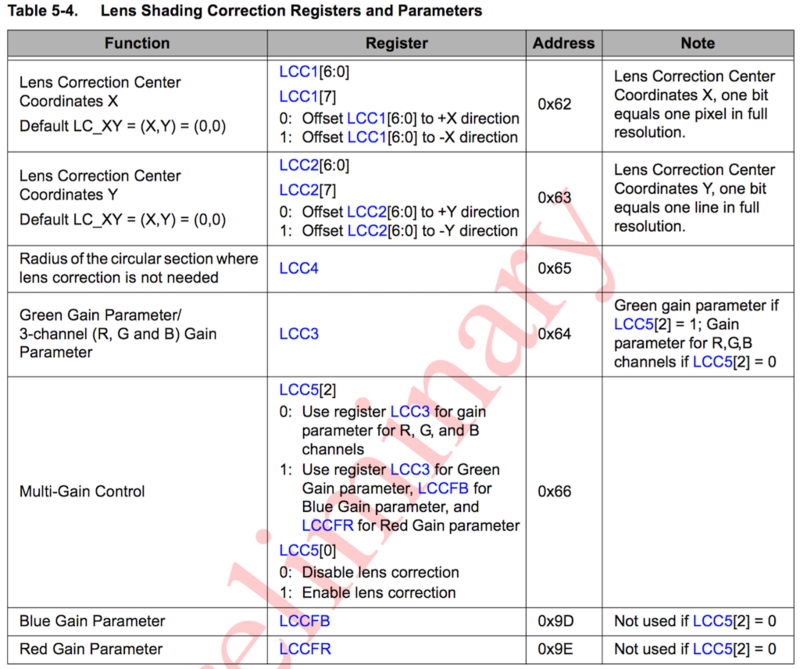 Instead of a single gain parameter, one can also instead, through register LCC5 (0x66) specify 3 different gains for Red, Green, and Blue (then using registers LLC3 (0x64) for green, LCCFB (0x9d) for blue, and LCCFR (0x9e) for red). # correction for lens sensitivity fall-off with eccentricity. Playing with this code you should be able to improve the uniformity of the image, but note the caveats below. Make sure that you have write access to the serial-over-USB device before you run this python code (e.g., sudo chmod 777 /dev/ttyACM0, or run the python program as root). beware that using this indoors with just pointing JeVois to a blank wall may not work, as the combination of a wide-angle lens, non-Lambertian surface properties of the wall, and non-uniform light source will likely increase the apparent shading. You should try outdoors, or maybe use a small photographic booth like what people do to take uniformly-lit pictures of items they want to sell on eBay. start with sending command setpar camreg true to JeVois, to enable access to low-level sensor registers. then issue commands setcamreg REG VAL where REG is the register address and VAL is the value. The setcamreg command can understand decimal, octal (if starting with a leading 0), and hexadecimal (if starting with a leading 0x) register addresses. Once you have found good settings for your particular lens, you may want to issue these commands at camera start time, by placing the commands in initscript.cfg on your microSD card.